Home » State News » Odisha Chief Minister lauded the role of veterinarians and agriculture officers in strengthening the rural economy. Odisha Chief Minister lauded the role of veterinarians and agriculture officers in strengthening the rural economy. Bhubaneswar:1/11/18: Chief Minister Naveen Patnaik on Thursday lauded the role of veterinarians and agriculture officers in strengthening the rural economy. Inaugurating a workshop on “Enhancing Farmers’ income through Upgrading Animal Resources — Role of Veterinary Officers” organised by the Fisheries & Animal Resources Development Department, the CM wished the newly-recruited Veterinary Assistant Surgeon and Assistant Agriculture Officers a very successful career. As many as 240 newly-recruited Veterinary Assistant Surgeon and 39 Assistant Agriculture Officers were handed out appointment letters by the Chief Minister on the occasion at Rabindra Mandap. Speaking on the occasion, the CM said, “I am glad that 240 Veterinary Doctors and 39 Assistant Agriculture Officers are joining government service today. I congratulate officers of both the Departments. 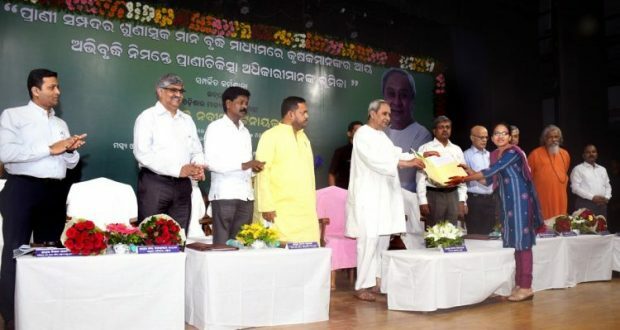 My government is also taking expeditious steps to fill up vacant posts, both in the technical and non-technical cadre, in Agriculture and allied sectors,” Naveen said. “I would like to commend the role of Veterinarians and Agriculture Officers in strengthening our rural economy. Since about 90 percent of farmers of the State are small and marginal farmers, the Livestock sector assumes immense significance in promoting dairy, goat, sheep and poultry farming as additional activities, which contribute substantially in enhancing the income and overall well being of farmers,” the CM said. The CM further said that in the Animal Resources Development Sector, in last 5 years, about 7 lakh farmers have been assisted for taking up Animal Husbandry activities. Similarly, in the Fisheries sector, about 1.5 lakh farmers have been extended livelihood options through freshwater, brackish water and marine fishing activities. Goatery, Poultry and Dairy Farming activities have been scaled up in the current year to support about one lakh farmers for multiplying their income.